Parents of an infant who died suddenly are trying to embrace fond memories of their baby, Nash Gregory Schupback. The baby with the bright smile would have been six months old this week. Shelly and her husband Todd have been trying to deal with this. After spending two days in bed, Shelly scoured the internet to find people who have endured a similar tragedy. She was guided to write a blog, which is here. She wanted to write a lot about how wonderful Nash was and ended up spending a lot of time writing about the day her son died. Shelly still didn’t know what to do – stay in bed? Family members suggested random acts of kindness honoring Nash. They came up with, Have a Nash Day (buying someone’s meal behind them at McDonald’s, putting lottery tickets on a windshield, etc). They are getting loads of kind acts from around the world now. Spreading smiles is consistent with who Nash was. Husband and father Todd said that Nash always woke up smiling. It’s all happened so fast and there is a lot of healing ahead. But, it appears that Shelly is using the acts of kindness to help her heal. 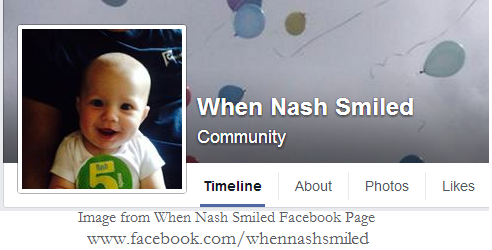 A Facebook page was created, When Nash Smiled. That page was created on July 9th. At this moment, there are 4511 fans. There is a story here on mlive. Finally, there is a video of Shelly singing to Nash below. When in the hospital, they continued to resuscitate Nash for thirty minutes – until the Mom said to stop. Finally, Shelly realized her baby had passed away, sat in a rocking chair, held her baby and sang his favorite song to him (Mamas Don’t Let Your Babies Grow Up to be Cowboy’s) one last time.